Green Plan It is an RHS campaign for school gardening initiative where over ten weeks starting in September, Year8/9/S2/3 students with the help of a volunteer industry mentor chose and area in the community or the school and plan, design and build a model of the garden they would love to create within that area. 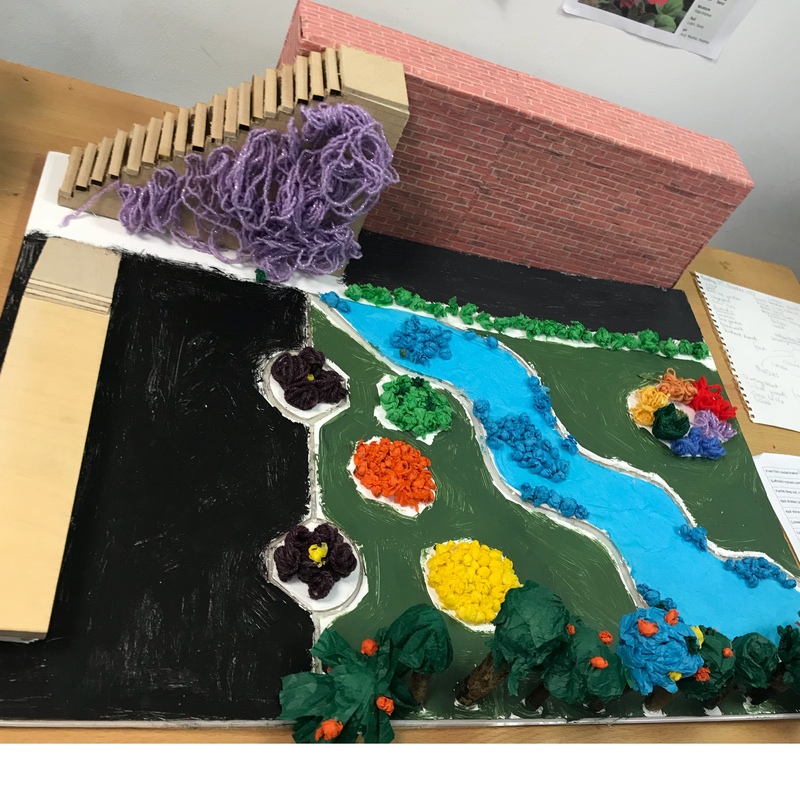 It ends in a celebration event in their area where their ideas, plans and models are assessed by a team of volunteer assessors led by the RHS Campaign for school garden team. The London celebration event was on Wednesday at the rather excellent Capel Manor College where I went a long as an assessor for the day. This isn’t a review of the event but a look at the results it achieved by it and despite rereading and rewriting this blog a few times, I can’t not get close to the amount of work that was put in by the students, schools, mentors and RHS. All the teams had put so much work and thought into their projects when really shone though from speaking to them. The team work achieved between them, puts many departments I worked in the past to shame. Speaking to strangers is never easy and even I struggle with it every time I speak but the teams never let this come across and I think their passion for their work really helped. One team even spent time defrosting the moss to use in the model! They also brought the rest of their schools into their plans, indeed a couple went into the community, knocking on doors with questionnaires to gauge public support. Then there was the building up of ideas, putting together a plan and building a model of their project, using so many different materials and getting help from all other departments in the school. But what really impressed me was the diverse ideas they came up with, all linked by one theme, the desire to produce something help to help other people and wildlife. They learnt that horticulture can let you do this in so many different ways from giving you areas to relax in and reduce stress levels at difficult times like exams, produce to sell and eat, recycling old used materials into something else useful, areas to bring communities together in, areas to attract wildlife from homes to food and they learnt how many skills are needed to do a project like this, the measuring, talking to others, teamwork and the different ways the team needs to work together to overcome problems, design, working within the boundaries of the site, working out levels, drawing, the aspect of the site and how that effects the plant, drawing ideas together, soil type and ph, researching the plants, learning about what they do, learning that plants won’t just grow anywhere, they need the right environment to survive, how to recycle and reuse. Tbh the list is endless but they learnt (and more importantly as it was fun!) will remember the huge positives that horticulture can provide for them, not only for the rest of their lives but their children’s too. It’s given them life skills and helped them see how all their school lessons from maths, history, chemistry, design etc link together and help them in their future careers. It was clear also to see how much time, effort and passion the mentors had also put in, giving up their time for free once a week for 10weeks is a huge commitment, their willingness to help out really does shine a bright light onto the students about how friendly our industry is. For me personally, it was a honour just to be there and see their hard work, passion and understanding of horticulture they had gained in just 10 weeks! It really did take my breath away and was one of the most joyous things I have seen in horticulture for a long long time, I came away feeling so more positive about the future for the industry, both in image and people wanting a career in it. I really think the RHS needs to be applauded for this initiative and I for one will enjoy watching it grow. Great blog! Good work Thomas and of course all the schools, mentors & assessors involved….not to mention the RHS! I hope to get involved with this with my local schools in the coming years….I wonder if it could somehow be combined with or linked to the BALI GoLandscape initiative (assuming it isn’t already?!) so that the key organisations within the industry are working together or at least complimenting each other in a joint bid encourage young people into our wonderful world of horticulture and landscaping?